Thomas and Friends is a classic children's TV series that has tested the sands of time and follows everyone's favourite train, Thomas. When a golden eagle has been spotted on Sodor, Thomas and his friend Percy go to investigate, however Thomas neglects his duties and Percy comes to the rescue to assist his friend. Ironically this is the last episode of the disc but is probably my favourite and just goes to show that this series will never date. 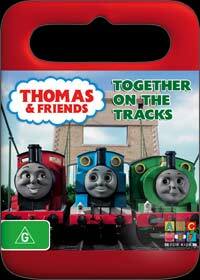 This DVD contains six episodes of Thomas and Friends from the popular television series and also features other characters such as Molly, unhappy about being ordered to cart empty carriages or when the train Gordon develops a firebox rattle, the other trains start teasing him, only to end up with egg on their faces at realising how difficult Gordon's job actually is. The series is great for kids as there are real-world children's issues involved and how working together actually makes things easier in the end. Presented in an aspect ratio of 16:9, there's little to complain about this DVD collection and for $19.95, it's well worth the price of admission alone.